Planning a lush landscape makeover? While major retail garden centers may seem like a good place to start, they often offer a limited variety of plants. 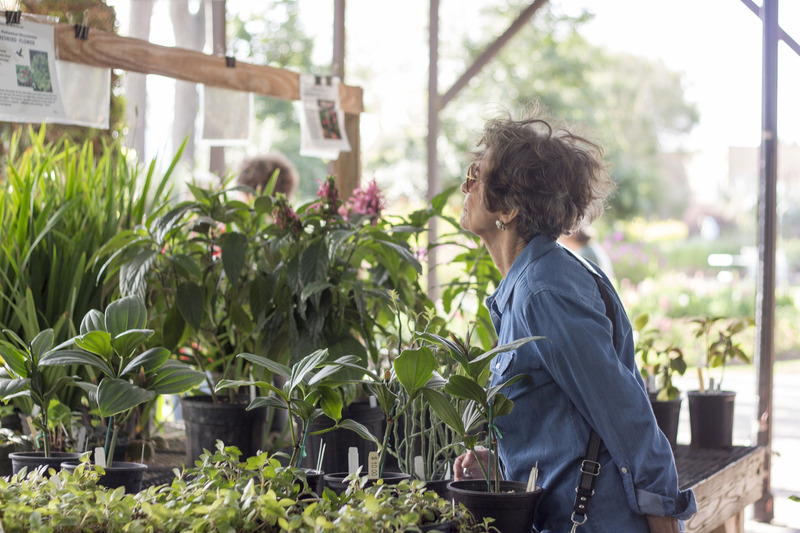 Make your yard stand out by heading to Mercer Botanic Gardens for the annual March Mart Plant Sale Friday, March 15, from 10 a.m. to 4 p.m. and Saturday, March 16, from 8 a.m. to 4 p.m. Early shopping is available for The Mercer Society (TMS) members Friday, March 15, from 8 a.m. to 10 a.m. and for TMS members with VIP Early Access Thursday, March 14, from 4 p.m. to 7 p.m. Shoppers will discover a variety of hard-to-find plants, flowers, and trees that thrive in sun or shade, winter or summer. Whether you are looking for ornamental trees or rare plants, March Mart offers a plethora of botanical gems. Ready to start shopping? Get a sneak peek of some of March Mart’s top plants below. The Purple Ghost Japanese Maple (Acer palmatum) is a new introduction to March Mart with intense red-purple leaves and black veins during the spring. The new leaves almost glow before they age to red in the summer and orange in autumn. This small but spectacular tree is ideal for gardens limited in size, wooded areas, courtyards, and containers. The Sunsation Magnolia (Magnolia X) blooms in late-spring with lovely 6- to 7-inch lemon-yellow flowers with a blush of purple at the base. Blooming from a very young age, usually by the second year if not sooner, this trouble-free, quick-growing plant matures to about 25 to 30 feet tall and 8 to 30 feet wide. Thriving in full sun to partial shade, Sunsation is a perfectly-shaped tree you will treasure as a specimen, foundation plant, or focal point of a border. A jewel of the shade garden is the rare and unusual ginger, Kaempferia Red Leaf. Gingers are so versatile that they can be grown in sun or shade. This Peacock Ginger grows round, red, 12-inch leaves that dramatically hug the ground or curl around edges and borders. Fat, white flowers with purple lips appear in its crown all summer. It is an ideal specimen for a shady pocket in the garden or planted en masse for a truly striking effect. The butterfly ginger (Hedychium ‘Pink V’) is the star of the hot summer show. This heat-tolerant ginger loves to bloom when the temperatures rise to 95 degrees and higher! Tall, 12-inch flower heads bear white, butterfly-shaped blossoms with a coral-pink “V” in its center that emits a sweet citrus fragrance. This 6-foot ginger is easy to grow in a sunny garden bed. Mercer Blue Thunbergia (Thunbergia battiscombei), with its brilliant blue, trumpet-shaped flowers and yellow throat in the spring and summer, is a stunning addition to any landscape. Its vine-like growth tends to drape so it does extremely well in hanging baskets or on an arbor or trellis. Light frost kills it, but the plant returns in the spring. This plant grows in part shade or part sun. Rose lovers will find over 40 varieties of ungrafted roses, including 10 varieties of Texas A&M’s Earth Kind Roses, such as Belinda’s Dream and Carefree Beauty. 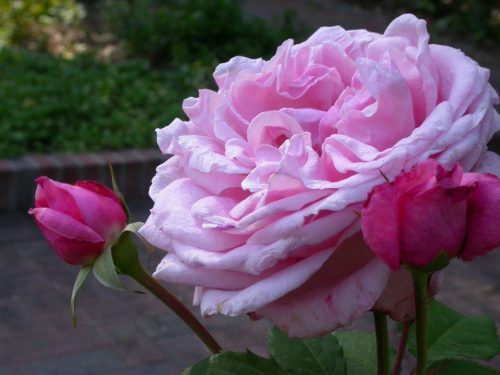 These beautiful pink roses are fragrant and grow very well in the Houston area. The cigar plant (Cuphea ignea) produces a profusion of scarlet blooms tipped in yellow from late-spring until frost. 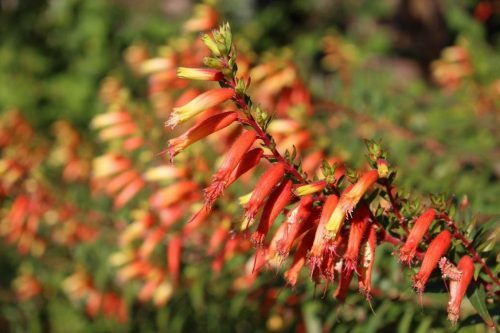 These delicate, tubular flowers are sure to attract hummingbirds to your yard all season long. Plant this easy-to-grow perennial for a tough addition to your garden that can survive even the coldest winters. 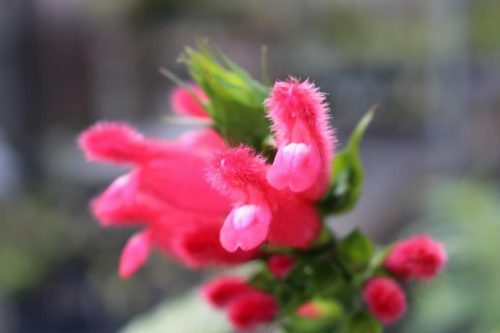 If you are looking for a stunning, smaller plant that can withstand the Houston heat, try Fuzzy Bolivian Sage (Salvia oxyphora). This tall, sun-loving salvia consistently draws “oohs and ahhs” at Mercer. Plant this pollinator magnet along a border or at the back of your garden and watch as its big, bold, fuzzy, fuchsia-colored blooms attract butterflies, bees, and hummingbirds all season long. If you have a shady spot in your garden to fill, consider planting ribbon bush or tapeworm plant (Homalocladium platycadum) for its unusual flattened stems and upright growth habit. Long wands of flat, jointed, and leafless half-inch wide stems make this an interesting specimen for large pots in a lightly shaded area. It is somewhat drought tolerant but loves humidity – a perfect plant for Houston! 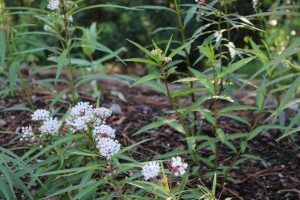 Aquatic milkweed (Asclepias perennis), a Harris County native plant, is unlikely to be found at garden centers or big box stores. 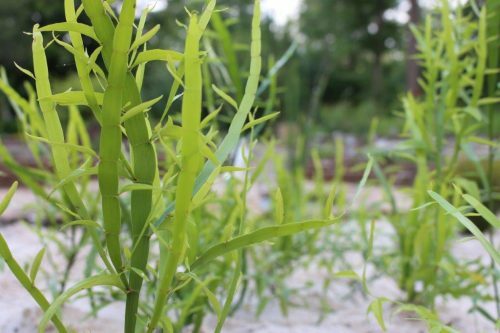 The aquatic milkweed at Mercer is grown from seeds collected within the county and perfectly adapted to growing in this area. The aquatic milkweed generally grows to about 12 inches, with a comparable spread. It will easily withstand a light freeze and can be rooted from cuttings, if you want to expand your milkweed population. Preferred by the monarch butterfly, this native milkweed features tender leaves perfect for feeding young caterpillars. In our area, the queen butterfly will also use the aquatic milkweed as a caterpillar host plant. For the vegetable lover, heirloom tomato varieties offer incomparable eating quality and flavor that has led seed savers to collect and pass them down through generations of growers. Many heirloom tomatoes are sweeter and lack a genetic mutation that gives tomatoes a uniform red color at the cost of the fruit’s taste. 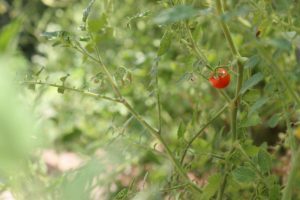 While the flavor of heirlooms surpasses many modern varieties, they do require more attention from the grower. Heirloom tomato varieties offered at March Mart include Amish Paste, Black Krim, Brandywine; Cherokee Green, Cherokee Purple, German Johnson, Glacier, Green Zebra, Japanese Black Trifele, Matt’s Wild Cherry, Nepal, Red Pear Piriform, San Marzano, Striped German, and Yellow Pear.